I am in Glenstal Abbey in Co Limerick on a 24-hour retreat with a priest colleague, taking time to pray, think and reflect. We arrived shortly after lunch, and joined the community in the abbey church for Vespers this evening and for Compline at the end of the day. The school term ended a few weeks ago, and while there is a group of students from Argentina here for an English language course, the few pilgrims and people on retreat hardly encroach on each other, and we are enjoying the grounds, the lakes, the woods and the sunny blue skies, as well as the swallows, which I associate with summer in Glenstal. This is, I think, my third time in Glenstal Abbey, having been here before as the keynote speaker at a Glenstal Ecumenical Conference in the 1990s, and here again last year, when I spoke at a one-day meeting of priests and readers from the Diocese of Limerick and Killaloe. That we may watch with you and pray. Who hold us ever in your care. Shine in our hearts eternal light. Let angels guard us through the night. The One in Three and Three in One. Amen. You have redeemed us, O Lord God of truth. Glory be to the Father, and to the Son, and to Holy Spirit. Save us, O Lord, while we are awake; guard us, O Lord, while we sleep. That we may keep watch with Christ, and rest with him in peace. Guard us, O Lord, as the apple of your eye. Hide us in the shadow of your wings. We leave after lunch tomorrow, which means we are going to miss the celebrations of the Feast of Saint Benedict on Wednesday [11 July 2018] and the blessing of four new bells in the abbey church. In Roman mythology, Vulcan (Volcānus) was the god of fire, including the fire of volcanoes, metalworking, and the forge. He is often depicted with a blacksmith’s hammer. His Greek counterpart is Hephaestus, the god of fire and smithery. In time, Vulcan came to be considered the manufacturer of art, arms, iron and jewellery. Roman tradition said the name of Vulcan was related to Latin words connected to lightning, which in turn was thought of as related to flames. Some scholars have believed his name was related to Velchanos, a Cretan god of nature and the nether world. This was refuted by Wolfgang Meid, but more recently Gérard Capdeville has argued for a continuity between the Cretan Minoan god Velchanos and the Etruscan Velchans. The Minoan god’s identity was that of a young deity, master of fire and companion of the great goddess. The stories of Vulcan may reflect the Greek myths of Theseus and the Minotaur and those about the childhood of Zeus on Mount Ida. Velchanos was depicted as a young man sitting upon a fork of a tree on coins from Phaistos dating from 322 to 300 BC, showing him as a god of vegetation and springtime. Later, Velchanos was depicted as a bull in the myths of Pasiphae and Europa. The cult of Vulcan enjoyed a period of popularity in the Roman Empire during the second and third centuries and he god had a temple in Rome on the Aventine Hill. The festival of Vulcan, the Vulcanalia, was celebrated each year on 23 August, when the summer heat placed crops and granaries most at risk of burning. There is a statue of Vulcan on the town hall in Sheffield, and the statue of Vulcan in Birmingham, Alabama, is said to be the world’s largest cast iron state. 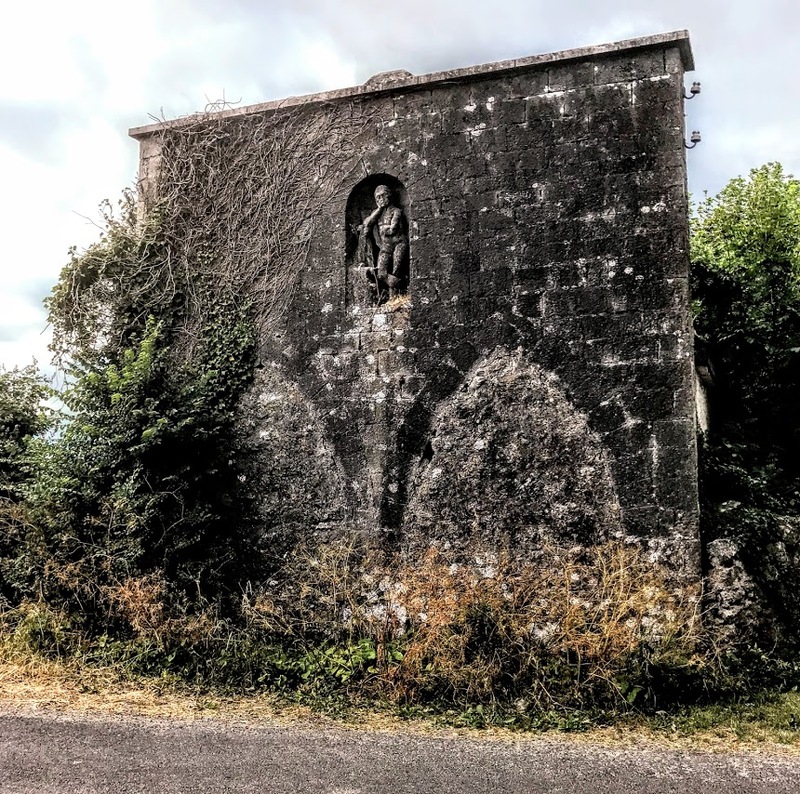 But imagine my surprise in the summer heat, and just two weeks after returning from Crete, to find a statue of Vulcan on the wall of an old smithy in the middle of rural west Limerick. The statue of Vulcan in West Limerick can be seen in Stoneville, on a back road between Rathkeale and Askeaton, and although it had been pointed out to me many months before I had forgotten its location until I came across accidentally on my way back from Newcastle West on Friday evening [6 July 2018], and again on my way from Rathkeale to Askeaton on Sunday afternoon [8 July 2018]. He stands in a round-headed niche in the front or south wall of this detached two-bay, single-storey former forge. This former smithy is said to have been built around 1870, although some local historians suggest it is at least 100 years older, dating from the mid or late 18th century. The statue is said to have been carved by Martin Scanlon, a craftsman born at Blossomhill, Rathkeale, in the 1740s. Even in the late 1700s, this figure would have been an expensive piece of work. It is a cut figure of a lame man working at an anvil, and in the past children regarded the Vulcan as a scary figure. The Stoneville silver mines were just across the road, and some local historians suggest the building may have been the silversmiths’ workshop. The old forge has a pitched slate roof and a rendered chimneystack. 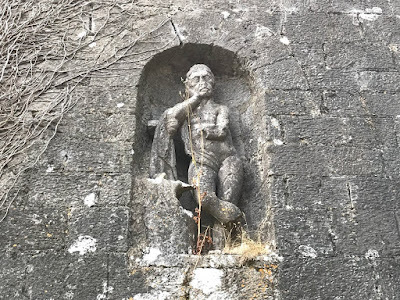 The dressed limestone curtain wall at the front or south elevation has cut limestone coping and the round-headed niche that holds the statue of Vulcan. Below the statue and the niche is a pair of pointed arch door openings at the front, with cut limestone voussoirs, but these are now blocked up. There are rough-cast, render-over-rubble, limestone walls on the other three sides. There is a square-headed opening on the east side with a two-over-two pane timber sliding sash window and a limestone sill, and a square-headed window opening on the west side. This former smithy is said to be one of the most remarkable examples of its type in Ireland. Although it is no longer use, this smithy, with its prominent site, is an important part of Co Limerick’s architectural heritage. In this summer heat, crops and granaries may still be at risk. We are still six weeks away today from 23 August, the traditional day of the Vulcanalia. When I stay in Cambridge, I have come to regard Saint Bene’t’s Church on Bene’t Street, opposite the Eagle, as my parish church. 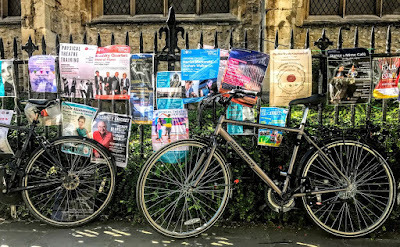 It is just a short, brisk and quick walk from Sidney Sussex College, and I have been welcomed at both the Sunday Parish Eucharist and at the early morning weekday celebrations at 8 a.m. But there are many churches and college chapels in Cambridge that I have felt welcome in too. In the past, I have preached in the chapels of both Sidney Sussex College and Christ’s College, I have been at both the Sunday Eucharist and Choral Evensong in the Chapel of King’s College, and at the mid-week term-time Eucharist in Westcott House. 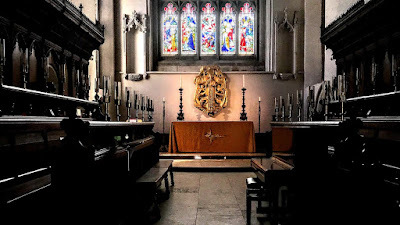 In addition, I have visited the chapels of most Cambridge colleges, and I have also been at the Sunday Eucharist in Little Saint Mary’s on Trumpington Street, one of the best-known Anglo-Catholic churches in Cambridge. In all these years, however, I had only occasionally visited the University Church or Great Saint Mary’s Church, and so it was interesting to spend a little extra time in this great church during my visits to Cambridge last week on my way to and from the USPG conference in High Leigh, near Hoddesdon, Hertfordshire. 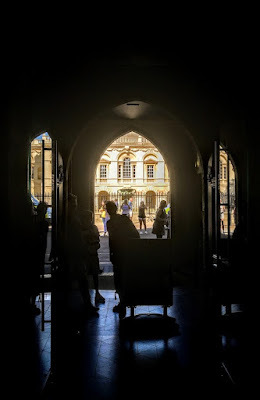 Saint Mary the Great is a parish and university church on Senate House Hill, at the north end of King’s Parade, opposite the Senate House and close to both King’s College and Gonville Caius College. It is known locally as Great Saint Mary’s or simply GSM to distinguish it from Little Saint Mary’s on Trumpington Street. Cambridge has no cathedral and is part of the Diocese of Ely. So, in many ways, Great Saint Mary’s serves not only as a parish church in Cambridge, and also as the university church for the University of Cambridge, and it has a role in the city similar to that of a cathedral. Indeed, Great Saint Mary’s is one of the 55 churches in the Greater Churches Group in the Church of England, which includes churches that have a cathedral-like ministry in their towns and cities. They include Bath Abbey, Saint Martin in the Bull Ring, Birmingham, Christ Church, Spitalfields, Saint Martin-in-the-Fields, London, Pershore Abbey, Saint Mary the Virgin, Saffron Walden, the largest parish church in Essex, Sherborne Abbey, and Selby Abbey. Great Saint Mary’s, which is also a Grade I listed building, is designed in the Late Perpendicular style and has been at the heart of Cambridge life for over 800 years, welcoming people from many backgrounds and nationalities. The church was mostly destroyed by fire on 9 July 1290. At the time, the fire was blamed on the Jewish population of Cambridge, and the synagogue was closed. King Edward I issued an edict in 1290, expelling all 5,000 Jews from England and confiscating their property. The old synagogue near the prison – later the site of the Guildhall on Market Hill – was given to the Franciscans, who had their main house in Cambridge on the site of Sidney Sussex College. The church was rebuilt, and in 1303, the University ordered that a special sermon should be preached at Great Saint Mary’s four times a year. The tradition of the University Sermon continues to this day. During the early years of Great Saint Mary’s, the church was the property of the crown, but on 15 July 1342 the land passed to King’s Hall, founded in 1317 and one of the predecessors of Trinity College Cambridge. Ownership of the site passed to Trinity College, and it has rested there ever since. The orders for the consecration of the new church were issued on 17 May 1346, but these were not enacted until 15 March 1351. Before 1352, the church was known as the Church of Saint Mary the Virgin, but since that year has become known by its present name. In the Middle Ages, the church became an official gathering place for meetings and debates for Cambridge University. The present church was built between 1478 and 1519, and the building costs were met largely by King Richard III and King Henry VII. King Henry VII donated 100 oak beams for the roof, with carved bosses. The oaks came from Chesterford Park in South Cambridgeshire which belonged to the Abbott of Westminster, John Islip, and the British Library holds a letter of apology from Henry VII apologising to the Abbott for cutting down his oaks. Originally, bells were hung in a wooden structure in the churchyard. The bells were moved to the tower in 1515 and the structure was dismantled. During the reign of Queen Mary I, Bucer’s corpse was burned in the marketplace. Great Saint Mary’s was condemned for harbouring the body of a heretic, and the churchwardens had to buy frankincense, sweet perfumes and herbs for a ceremony of reconciliation before the church could be used for services again. 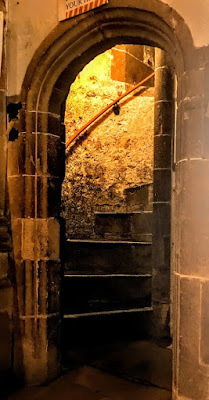 However, in Elizabeth I’s reign, the dust from the place where he was burned was replaced in the church in 1560 and now lie under a brass floor plate in the south chancel. Queen Elizabeth visited the Church in 1564. As the English Civil War began to unfold, Puritan parishioners resented an elaborate choir screen built by the University vice-chancellor in 1639, and Cromwell’s ‘multitudes of enraged soldiers’ later vandalised it. In 1641, a Trinity academic flew into a ‘greate rage’ when the churchwardens started to follow Parliament’s orders to remove the altar steps. Royalist academics even complained that Cromwell watched as his soldiers ripped up the Book of Common Prayer in the church. For the next 200 years, the Puritan faction dominated at Great Saint Mary’s. Galleries turned the church into a hall for preaching, centred on the imposing triple-decker pulpit. The bells were replaced in 1722, and in 1724 the Society of Cambridge Youths was formed to formalise the responsibility for ringing them. This society claims to be the oldest bellringing society in Britain and the second oldest at any church in the world with a continuous ringing history. The church continued as a gathering place for meetings and debates in Cambridge until 1730, when the Senate House was built across the street. Great Saint Mary’s became datum point from which the first English milestones were measured in 1732. During the 18th century, the sermon became the main focus of theology teaching, the whole church interior was transformed, and the church was restored by James Essex in 1766. When Henry VII’s oak roof showed signs of decay in 1783, a supplementary one was built a few feet above the original and the two were tied together. 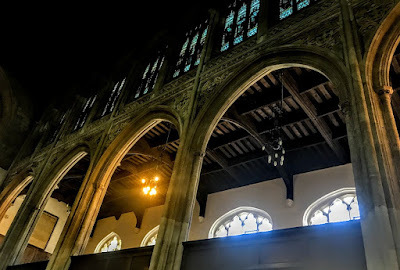 The architect Sir George Gilbert Scott (1811-1878) carried out restoration work in 1850-1851, and soon after he was involved in the restoration of Little Saint Mary’s on Trumpington Street. He was followed at Great Saint Mary’s in 1857 by Anthony Salvin (1799-1881). 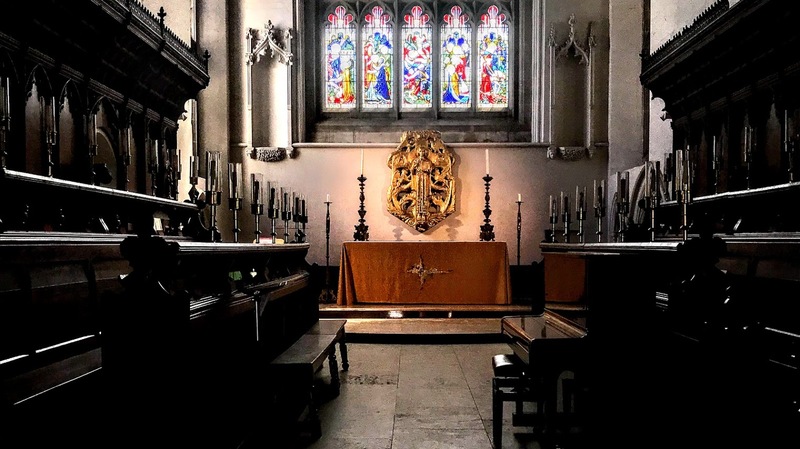 From the 1860s, stained glass and a raised High Altar returned to Great Saint Mary’s, bringing colour and ritual back into the Anglican worship here. The interior was re-arranged with a new carved choir stalls and fixed pews, and the north and south galleries were removed, although the west gallery still stands. 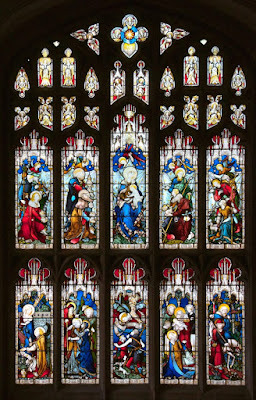 The stained glass in the east window depicting the Nativity of Christ was installed in 1869 and is the work of the Chance Brothers partnership in Birmingham, which specialised in adapting the colouring techniques used by the best mediaeval glaziers. Other stained glass by Hardman was added in 1867-1869. The south porch was rebuilt in 1888, and there was further restoration work in the 20th century. The golden sculpture above the High Altar, the Majestas Christi, the Majesty of Christ, was made in gilded wood by Alan Durst in 1959 and was installed in 1960. Its imagery draws on the Book of Revelation. Christ stands in front of the cross as the tree of life, his hands and feet are marked by the wounds of the crucifixion and around him are the lion, ox, man and eagle, who symbolise the four evangelists, while Christ treads on a serpent. The Latin inscription on the book in Christ’s left hand means, ‘The leaves of the tree for the healing of the nations’ (Revelation 22: 2). As the university church, Great Saint Mary’s continues to play a role in the life of the University of Cambridge. For example, university officers must live within 20 miles of Great Saint Mary’s and undergraduates within three miles. The church also hosts the University Sermons and is home to the University Organ and the University Clock. Saint Mary the Great is unusual in housing two self-contained pipe organs, a Parish Organ in the chancel for the regular congregation, built in 1991, and the University Organ in the West Gallery, played for University services. The University Organ was added to in the 18th and 19th centuries until a major rebuild by William Hill in 1870. There were further restorations in 1963 and again in 1995, and the organ was rededicated in 1996. Great Saint Mary’s remains one of the few churches were a double organ concerto can be performed. The University Clock chimes the ‘Cambridge Quarters,’ later used by Big Ben, the clock tower of the Houses of Parliament. The old ring of bells was replaced in 2009 with a new ring of 13 bells cast by Taylors Eayre and Smith. Some of the original bells have been retained to continue sounding the Cambridge Chimes. The funeral of Stephen Hawking (1942-2018), the theoretical physicist, was held in Great Saint Mary’s earlier this year [31 March 2018] before his ashes were interred in Westminster Abbey. Great Saint Mary’s stands in the Liberal Catholic tradition of the Church of England, and is a member of Inclusive Church. The church works with partners at home and abroad in social and mission projects. 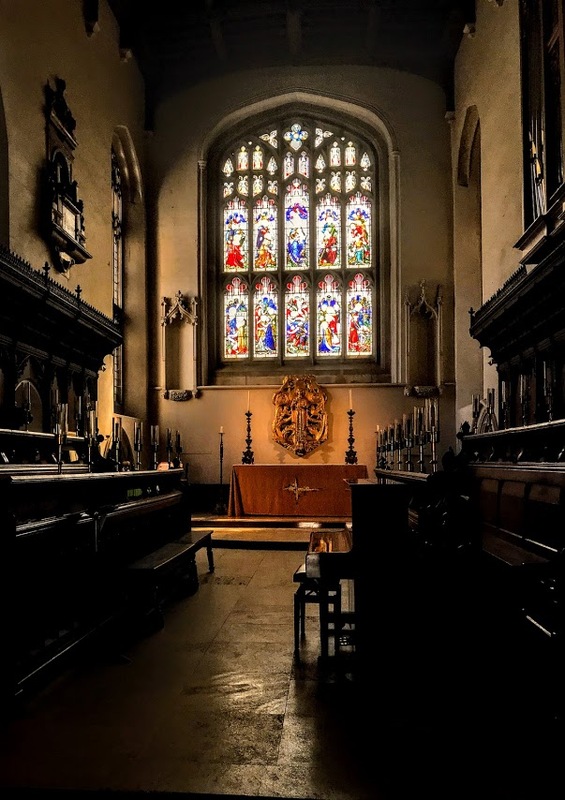 The mission of Great Saint Mary’s includes the Michaelhouse Centre and Chaplaincy in Trinity Street and the chaplaincy to the non-collegiate members of the University. Past Vicars of Great Saint Mary’s include Mervyn Stockwood (1955-1959), later Bishop of Southwark,Hugh Montefiore (1963-1970), later Bishop of Kingston and then of Birmingham, Stanley Booth-Clibborn (1973-1979), who became Bishop of Manchester; Michael Mayne (1979-1986), later Dean of Westminster Abbey; David Conner (1986-1993), afterwards Bishop of Lynn and then Dean of Windsor; and John Binns (1994-2017), now a Research Associate at the Centre of World Christianity at SOAS in London. John Binns was a founding director of the Institute for Orthodox Christian Studies in Cambridge where he remains a Visiting Professor, and he is known for his strong links with the Ethiopian Orthodox Church. In recent weeks, Canon Adrian Daffern, Vicar of Woodstock and Bladon, and Area Dean of Woodstock in the Diocese of Oxford, has been appointed Vicar of the University Church of Saint Mary the Great with Saint Michael, Cambridge, and is be instituted and inducted to his new post on 5 September 2018.